People love adventure, we constantly crave memorable moments to share and remember. We wish to experience things that catch our breath and leave us speechless. For some, RVing does that, it brings us to those moments we want to live and enjoy. We take everything we own on the road, which is an adventure itself, and find a new destination to call home. What a life and a big decision. When we RV we adapt to new surroundings, new people and unpredictable days. RVers are resilient, it takes quite a bit to ruin an RVers day on the road. We expect the unexpected and enjoy the good and bad moments. So, where did this lifestyle come from? We’ll have to go back to the 1800s, specifically. We didn’t have the number of jobs we do today for people to make incomes, so for many people moving around was just how they were able to make a living. This includes immigrants coming into the country, mainly from Europe, and gypsies who chose to travel, very similar to the choice RVers today make. It’s often talked about how groups of people would just caravan together, they are big parts in our US history. Such as the Oregon Trail, which has to be the most famous of this bunch, reached to about 2,000 miles. There was also the Santa Fe Trail, Chisholm Trail, California Trail, Mormon Trail, to name a few. Here is a replica of a covered wagon made by MM handcrafts. Because the wagon bed is narrow, many families would construct an “overjet” for additional space. An overjet is created by nailing boards or planks on top of the wagon bed that extended out over the wheels. This would create space to place mattresses for sleeping on either side of the bed. Additional bows would be inserted to stretch the canvas to cover the overjet and keep the weather out. The area under the planks in the wagon bed could be used for storage. It’s kind of amazing, the creativity those people had in the time with the number of resources they had. Before RV’s anyone who wanted to camp in this manner was limited to the railway train routes. People would own or rent a railway car and find sidings on the tracks to camp on. When RV’s came out it gave people a new sense of freedom and luxury when camping. In 1910 one of the first motorized RV’s I could find information on was built and displayed at Madison Square Garden in 1910. 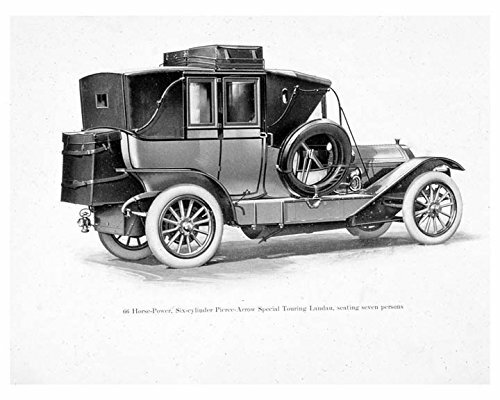 The first RV was named Peirce Arrow Touring Landau. Now these RV’s were completely different than what we know as an RV today. The closest resemblance of that RV today would be a Class B van camper. Unlike our RV’s today they did not have restrooms and they usually only had a fold down bed and possibly a sink. Roughly twenty years later in the 1930s luxury in the new and improved RV’s of that time became more of a demand. They all started to come equipped with bed’s, dinettes, water tank’s, restrooms and electricity. Because these features became standard it shifted to a wider advertising opportunity for the industry. Fun Fact: In 1929, Wally Byam built the first Airstream trailer. He and his wife drove all over the country to advertise the brand. Slowly but surely Airstreams became one of the most known and well loved RV’s we know today. Above is a photo of Wild We Wander’s Airstream. When World War ll ended the RV industry boomed, more Americans wanted to be mobile and have fewer attachments. I wouldn’t blame them. When soldiers came home all anyone wanted to do was spend time together and RVing was a way for people to reconnect with each other and disconnect with the world. By the 1950s there were many styles of Rv’s From tiny build it yourselves to 30ft models. Travel trailers became true towable RV’s by this time, creating another way to RV on the road. Of course, there are countless RV brands out there. Many got their footing between the 1950s-1970s. With over 100 years passing since the first RV, it’s said by the Recreation Vehicle Industry Association that nearly 8.2 million households own RV’s. Today there are roughly 10 types of RV’s, that doesn’t include the countless floor plans of each one. Here is a run through of the RV’s we have today featuring our featured RVers on Open Road Chronicles. Maybe you will learn of a few you didn’t know about. Class A: These resemble buses in size and shape. They tend to be more expensive from what I would want out of a Class A and they require engine maintenance which is not for everyone (pointing at myself). One really great thing is you are in your RV while you drive and travel which is a great convenience for long trips. Her is a photo of a Class A motorhome. This one belongs to Living Life In Between. Class B (AKA Campervans): From a quick view they look like normal van’s. Though they are small in size these guy’s can be pretty expensive. People enjoy the fact that these are easy to maneuver. Though since they are so small some people have a problem with the amount of space they have in a Van. A very neat trend that is popular right now is people are buying empty vans and converting them into one of a kind Class B’s. I’m always amazed by what people do with the small space. This is a photo of a Class B and belongs to Minimal Millennials. Class C Motorhome: These are usually placed on truck bodies while being manufactures (non-removable). You generally see them on Ford F350s or E450s since they tend to work well with all the weight and physical demands while RVing. I find these to be more affordable than Class A’s. If you are looking for a Motorhome though they are smaller and easier to drive. They usually have slideouts so space in these are not an issue. This is a photo of a Class C. A solo RVer Marcelle Phene calls this home on the road. Truck Camper: These are much smaller, but don’t let their size fool you. The RV is directly placed on the bed of a truck and the size is about the size of a truck bed as well, give or take a few feet. These RV’s are great for the people who love to travel light and still take everything with them. These Rv’s are fun for going off the beaten path since you don’t have to pull a large vehicle behind you. This photo is what the Mobile Hobos call home while Full Time RVing. Pop-up Camper: This is one of the lighter RV’s out there since they fold down while you drive pulling them on the road. You don’t need a big truck to pull these Rv’s. Small SUV and Van’s can pull these while traveling. I don’t see too many full-timers in these, since I assume the set up would be tedious, but they are great for weekend camping and are very easy to use. Teardrop Camper: These are so fun to look at. Teardrops are very small, usually, they have a bed inclosed inside the rig and you have an outdoor kitchen in the “trunk” of the RV. I would imagine these are great for those who love the outdoors but prefer not to tent camp. These are so lightweight that even a motorcycle can pull a small one. Travel Trailer: These RV’s can be as long as Class A’s and Fifth wheel’s but they are lighter in weight. The first RV Justin and I bought was a travel trailer. When we looked for an RV we found countless floor plans in travel trailers, so I’m sure you will find one you love. Here is an example of a travel trailer belonging to The Stream Lined Life. Hybrid Trailer: These are a cross between a travel trailer and a pop-up camper. These make it convenient when towing, so you don’t have to pull a huge RV on the road but you don’t compromise the space when in a spot. Fifth Wheel: These are similar to travel trailers except their front extends over the bed of a truck when towed. That creates higher ceilings and a more open feeling. These can be pretty heavy duty and you need a very sturdy vehicle to capably tow one. Fifth wheels also have some great floor plans and do come in smaller sizes. I find that large families traveling love to have fifth wheels since the space in this type of RV isn’t as compromised. Here is a photo of a Fifth wheel owned by The Freeway Four. Toyhauler: These can be many forms. They can look like travel trailers or fifth wheels. The difference is that these RV’s have a huge entrance in the back of the rig, similar to a garage and opens the RV creating a spacious feeling. 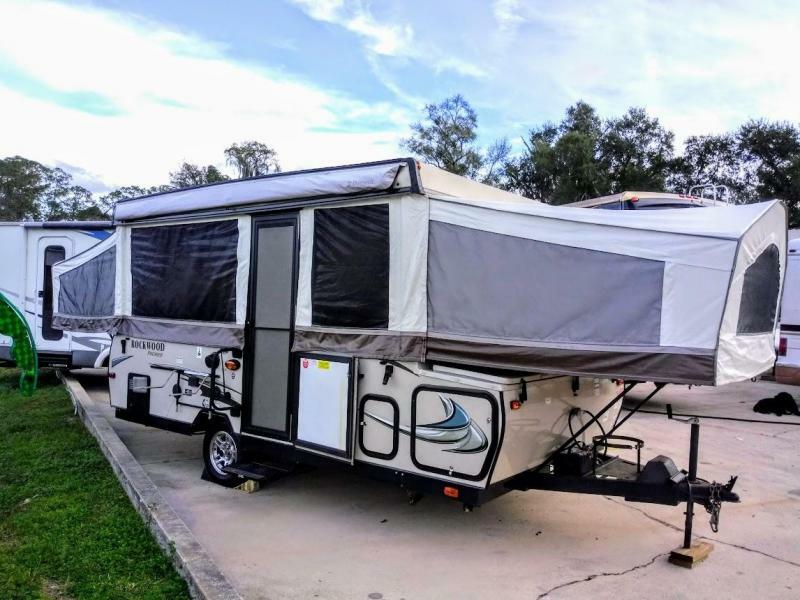 I’ve always wanted to get one since it looks amazing to have that openness when boondocking and having amazing views as your backyard. Getting the chance to learn about this history of where the RV lifestyle came from has been so much fun. I hope you all enjoyed reading this information and maybe learned something you didn’t know before. I definitely feel much more connected with the journey my family had this last year knowing more about where it all started.